Pope Francis visited mainly Buddhist Myanmar Monday with a highly fragile trip to a nation facing sharp global criticism for the presumed ethnic cleansing of its Rohingya Muslim minority. Catholics in vibrant ethnic traditional dress waved flags and danced at Yangon's airport in a joyful welcome for the pope, making the first visit to the country by a pontiff. The visit has come about as Myanmar's military stands charged with waging an ethnic cleansing campaign up against the Rohingya Muslims. More than 620,000 have fled a crackdown in northern Rakhine state for neighboring Bangladesh over the past three months. The pope's four-day visit intensifies pressure on Myanmar over its treatment of the stateless minority, a group he has called his "brothers and sisters" in repeated entreaties to ease their plight. His messages are going to be scrutinized by Buddhist hardliners of any reference to the word "Rohingya", an incendiary term in a country in which the Muslim group is reviled and branded "Bengalis" -- alleged illegal immigrants from Bangladesh. 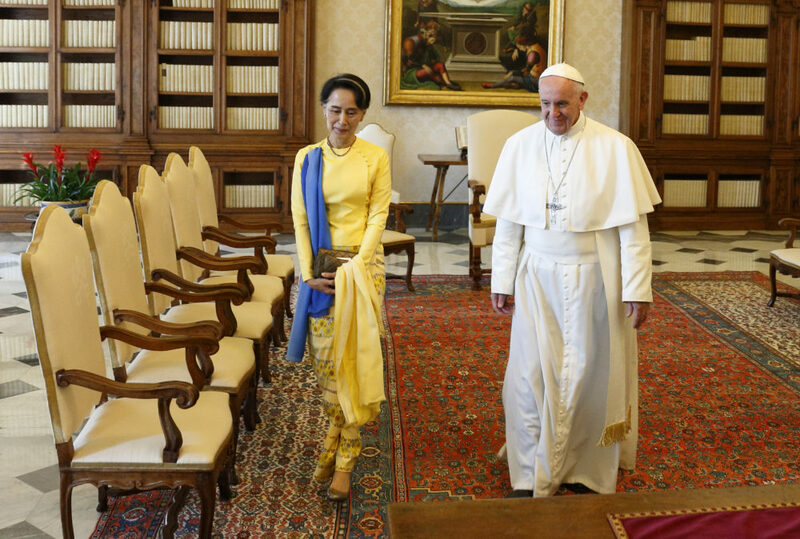 Francis will meet civilian leader Aung San Suu Kyi, a Nobel Peace Prize winner whose luster has faded as a result of her failure to speak up extensively for the Rohingya. He will probably also hold discussions with army chief Min Aung Hlaing -- a session between a religious leader who has championed the rights of refugees and the man accused of supervising the brutal strategy to push out the Rohingya. Speaking to a large group of 30,000 people today St Peter's Square, briefly before he left Rome, the pontiff said: "I ask you to be with me in prayer so that, for these peoples, my presence is a sign of affinity and hope." His visit is a historic chance for Myanmar's flock to get close to the head of their church. Myanmar's approximated 700,000 Catholics constitute about one percent of the country's 51 million people and are generally spread in far-flung corners of the nation, most of them roiled by conflict. About 200,000 Catholics are coming into Yangon, Myanmar's commercial capital, by airplane, train and car ahead of a tremendous open-air mass on Wednesday. "We are prepared to welcome the Pope cheerfully... with pure hearts," a woman from the northernmost state of Kachin told AFP, one of the hundreds waiting near the archbishop's residence in Yangon. But the Rohingya crisis frames the pope's visit. The army, which ran the country with an iron fist for nearly half a century, insists its Rakhine operation was a proportionate response to Rohingya "terrorists" who raided police posts in late August, killing at least a dozen officers. But rights groups, the UN and the US have accused the army of using its operation as cover to drive out a minority it has oppressed for decades. That is at odds with views inside the country. "The vast majority of people in Myanmar don't believe the international narrative of abuse against the Rohingya and the refugee numbers that we're seeing in Bangladesh," said Myanmar-based political analyst Richard Horsey. "If the pope did come and weigh in heavily on this issue, it would inflame tensions and it would inflame public sentiment," he added. Days before the pope's visit, Myanmar and Bangladesh inked a deal vowing to begin repatriating Rohingya refugees in two months. But details of the agreement -- including the use of temporary shelters for returnees, many of whose homes have been burned to the ground -- raise questions for Rohingya fearful of coming back without guarantees of basic rights. Nur Mohammad, a 45-year-old Rohingya imam at the Nayapara refugee camp in Cox’s Bazar in Bangladesh, said he hoped the pope would tell the Myanmar government to accept Rohingya, "give citizenship to them and end all discriminations against them."